I saw it as it happened. Perhaps before. Thirty-three months ago, I settled in front of the television, my two-year-old son Matthew on my lap, to watch the latest space shuttle launch. Watching space launches is an old habit for me. I watched Mercury and Gemini launches as a curious child. I savored the Apollo moon launches and landings as a star-eyed teen. The high point of a lifetime of spacewatching came six years ago, when I flew to Cape Kennedy to witness the fourth launch of the Shuttle Columbia. I was still teaching science in Middlebury at the time, reason enough to go. But because I was there to write about the flight for the South Bend Tribune, I enjoyed the perks of the press. My own desk in the press center. Tours of Spacelab and the pads. Briefings and photo opportunities. And a seat in the press grandstand, just three and a half miles from the pad. No one can get closer. And no experience compares. The STS-4 launch was a heart-leaping stomach-shaking exercise in noise, power and drama. I’ve often called it the best two minutes of my life. But I almost missed the launch of 51-L. It had been postponed four times, and I had lost track of the date and time of the latest attempt. Barely twenty minutes before liftoff, I remembered, gathered up Matt, and went into the family room of our Goshen home. As the countdown proceeded, I told my son what he was about to see. He seemed most interested in counting down the seconds along with the TV. Setting Matt aside, I grabbed for a blank videotape, pushed it into the VCR, pressed RECORD. The tape started rolling just as the huge solid rocket motors ignited and Challenger lifted off the pad. By coincidence, I realized later, it was the first use of the same pad — 39B — that I had clambered over with a press tour four years earlier. For the first minute, everything was as it had always been. But the feeling of apprehension did not go away. Then the scene on the screen switched to the view from a telescopic camera, and I saw a gout of yellow flame where I knew from experience that no flame should be. The next few seconds were an eternity. Familiar images now, after so many replays. The blow-torch flickered, flared, enveloped the huge external tank, exploded with sudden fury. Suddenly there was no Shuttle, only a roiling white cloud shot through with yellow and black. NASA’s narrator blithely rattled off Challenger‘s speed and altitude, even as I searched, horrified, for any sign the spaceplane still existed. The giant boosters, unleashed by the explosion, went careening through the sky like errant fire snakes in what would become this generation’s most vivid image of space travel. Fragments of the shattered vehicle rained out of the sky, trailing plumes of white and grey smoke. I did not need the confirmation. 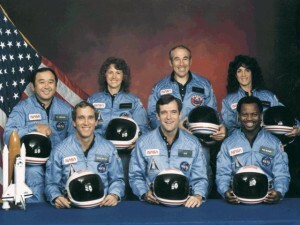 I already knew that Challenger was gone, its crew dead. I hugged Matt close and let the tape keep rolling. I called my wife at Miles Laboratories. I cried. The loss of Challenger cut deep. It was a human tragedy, a jarring failure of technology, a nightmare ending to a dream. As months passed and the causes of the disaster were revealed, it proved to be a shocking betrayal of faith as well. I suffered all of those cuts, and one more. I had been to KSC, to NASA’s Ames Research Center, to Cape Canaveral. I had interviewed half a dozen astronauts, written about the Space Station and the 25th anniversary of spaceflight, taught about the promise of the new frontier. And I was still the ten-year-old with eyes of wonder. It was personal. It hurt. This week, I sat down for the first time since the accident to watch the tape I made that day. There were surprises. I did not remember that the long-range cameras had caught the metal rain falling into the sea. I did not remember the white splashes greeting tumbling fragments of the broken orbiter after their nine-mile fall from the sky. It hurt. But not as much. Healing follows grieving. Folk wisdom tells us to get back on the horse as soon as possible after a spill. A soldier’s code of honor dictates that the cause the fallen fought for not be abandoned. Both principles apply. It has taken us a long time to get back on the horse. 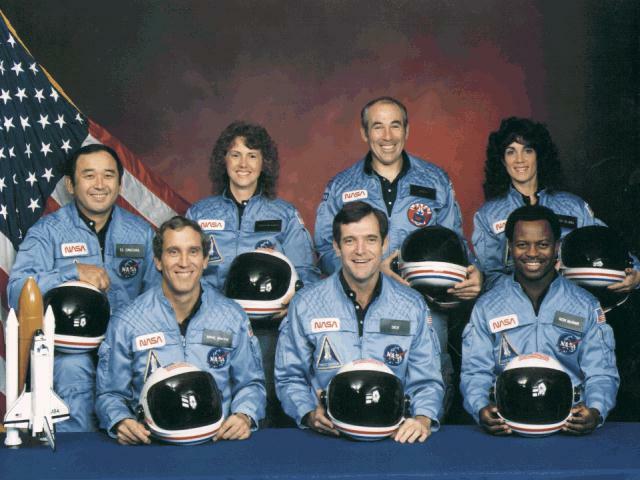 But we stand ready at last to do honor to the Challenger Seven in the only way that really matters — by carrying their work forward. Where will I be when Discovery lifts off? In front of my television, remembering with sadness, watching with hope. I have seen one Shuttle fall shattered from the sky. I hope never to see that sight again.